You may be the proud owner of a Ford F-150, but do you feel you lack the experience needed to tow like a pro? Or perhaps you have several trailers for your boat, camper, and ATV, or equipment that you use for work, and you’re looking for an effective way to manage your towing fleet. Ford now has the solution you’re looking for: Pro Trailer Backup Assist. This system is simple to use. With the help of a camera and an identification tag, the truck detects the presence of your trailer and performs some of the driving maneuvers for you. The most work you need to do is to turn the wheel to point the truck and trailer in the right direction. Preparing for towing only requires some simple precautions and a few minutes of setup. The first step is to install a small sticker, which looks like a checkered flag, at the specified location on your trailer. Next, you take a few measurements and enter them into the truck’s system when prompted. The F-150 can store information for up to 10 different trailers. Once this setup for a trailer is complete, you can prepare to tow it at any time by connecting it securely to your truck, selecting the appropriate trailer profile, and pressing OK.
After this is activated, trailer control is managed by the driver using only the pedals – the truck controls the steering on its own. Occasionally, if a turn is too tight and the hitch is rotated far to the left or right, you may need to give the wheel a few turns to point it in the right direction, but you won’t need to do anything more. 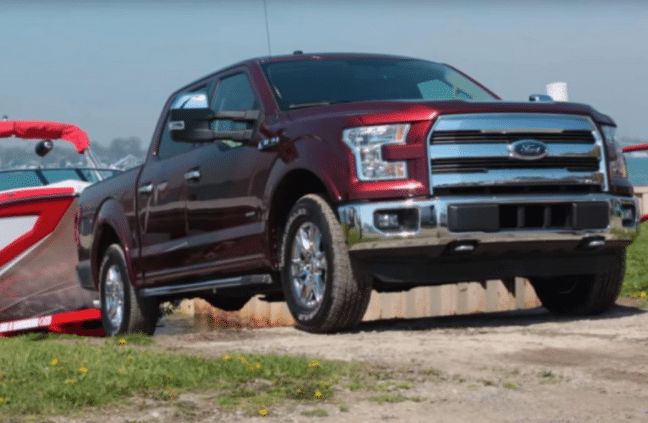 Anyone can become a towing pro with the Ford F-150!